In the spring of 1978, I was informed by the owner of Coors NE in San Antonio, Charles M. Duke, Jr., a retired Air Force General and the 10th man to walk on the moon, that he had decided to sell the operation to the Azar family of El Paso. When informed of the pending sale I was totally caught off guard. As the VP, I had helped build the company when Charlie was award the franchise in 1975. With only Coors in our inventory, we had been able to achieve a market share of 13% while running a profitable and growing company. Compared to walking on the moon, running and owning a beer distributorship was somewhat anti-climactic, so Charlie sold. The Azar family, a highly successful and longtime Coors wholesaler in El Paso, had their own idea on how to run the distributorship and it did not include me. With the help of Charlie’s partner, who lived in Kansas, I received a call from Coors of Kansas. The President, Terry Scanlon, who was also the state Democratic chairman, was looking for a general manager. While I was impressed with Terry and the operation, as Coors had about a 60% share, my family and I had reservations about moving to Kansas. Shortly after returning to San Antonio, I received a call from Terry’s partner, R.D. Hubbard. At the time, Hubbard was the President of Safelite Auto glass. R.D., “Dee,” asked me to come out to his Palm Springs home for a visit. He was awaiting my arrival at the small airport, wearing all white with gold chains, and driving the top-of-the-line Mercedes. This was quite a sight for me considering I was only 27. After spending most of the day with Dee and hearing his story, I knew I had to work for him, and I agreed to take the job. Dee was from a small town in the middle of Kansas and after graduating from college, he became a middle school teacher and basketball coach. During the school break one summer, Dee was hired by a senior executive at Safelite and within a year he had become a key employee of the company. He was quickly promoted, fired the man who hired him, and became the President. Safelite took off. Dee started investing in numerous businesses, including real estate and race tracks. He branched out and starting buying quarter horses and eventually owned the horse, Denim and Diamonds, which made it all the way to the All American Futurity in Ruidoso. Dee also owned Ruidoso Downs race track. Safelite was owned by Lear Sieglar, and when the opportunity for Safelite to purchase a large glass manufacturer in Kingsport, TN, the purchase was rejected by the Chairman of Lear Sieglar. Dee bought out the non-profitable glass company, and within a year he had turned the business into profitable entity. Dee named the glass manufacturer AFG Industries. Dee and Terry had purchased the Coors operation from the previous owner who had recorded a pricing conversation between himself and the Coors rep. The conversation resulted in Coors getting fined by the government. By the end of 1978, Dee made Terry an offer for his half of the business and Terry sold out. We had great success over the next two years, including buying the Hutchinson operation. Due to the strict Kansas residency laws I could not own any of the business. I bought Texas Beers and moved back to the Lone Star State. Dee sold the business to Larry Fleming who still maintains ownership of the distributor. Dee went on the buy more race tracks across the country, including Hollywood Park. Dee also bought Big Horn Golf Club in Palm Desert in 1996, along with 12 other courses. Palm Desert has been a great success and Dee now resides there. In some ways, Dee might be called one of the first private equity investors in beer. 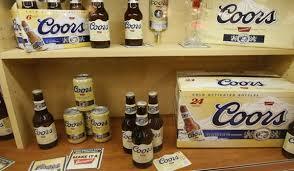 He is a remarkable investor and did well in the short time he owned Coors of Kansas. He truly is The Wizard of Oz…. THIS IS THE LAST POST OF 2014. NEXT ONE WILL BE JANUARY 6, 2015. HAVE A GREAT CHRISTSMAS AND A HAPPY NEW YEAR! Beer fodder: Not beer but a great commercial for Christmas! It will work. I am a marketing genius…. For many years Heineken ruled the import sales in the US market despite using an independent importer and employing wine and spirit houses as major distributor networks. Only when Corona caught fire and rocketed past Heineken in the 1980s did Heineken change. They first took over importing rights, and later, moved distribution rights to the beer network. The change caused brand sales to grow dramatically, but Heineken still could not catch Corona. They did, however, develop one of, if not the best, marketing departments for beer in the US. Then the recession hit. In 1999, 18 European countries adopted the Euro as their currency. Initially the exchange rate against the dollar was established at 1:1743. Prior to the establishment of the Euro, countries had their own currency. When Warsteiner came to the US in 1980, the exchange rate against the mark was.80:1. The dollar was stronger than the mark for many years until the Euro was created. The exchange rate made selling beer for Europeans very lucrative. Exchanging marks for dollars was just good business. Many of the imported brands did well as their breweries invested in the US. By 2000, the dollar’s strength against the Euro increased, going from the 1.17 exchange rate to a low of .8252. It did not stay that low for long, and by July of 2008, the dollar against the Euro was at a high of 1.6038. For the European breweries, enough was enough, At Warsteiner, for example, controlling (accountants) started raising prices dramatically and reducing overhead including, staff and marketing. The result of these moves cost these breweries sales and market share, the exception being Stella. Heineken also lost sales and share, as the cut backs hit everyone hard. For years the European economy has been stagnate, and coupled with the changing demographics, this has resulted in slowly dying beer sales. In fact, NAs dominate some countries. In Spain, the NA market is over 10%. One brewery in Germany estimated that by 2020, their overall sales could be 22% NA. Breweries pushed for growth in other countries starting with Russia. That country, however, tripled beer taxes recently, thus resulting in a decline in sales. China has been targeted, but business there has also been a challenge. Africa and South America support locally made brands. In the last several years, European breweries have attempted to return to growth in the US. Heineken has ramped up marketing and staffing, as have other smaller importers like Warsteiner. So why now? The exchange rate for the Euro closed recently at 1.23. It has been declining for some time. As the dollar gets stronger, this makes the US beer market much more attractive for these overseas breweries. Recent IRI numbers for Heineken are now in the plus side. The decisions made by these companies in the middle of the last decade are now being reversed. Breweries such as Bavaria, Carlsberg and others, will look back to the US as the dollar regains strength. They will attempt to recapture what they walked away from as the executives behind these decisions have retired. These European breweries have been around for centuries, for them, the sooner you fall behind, the more time you’ll have to catch up.